Another swamp recovery from a wartime crash site, the B-17 known as the Swamp Ghost has found a per manent home with the Pearl Harbor Aviation Museum, on historic Ford Island, Honolulu, Hawaii. After retirement from the Israeli Air Force, the A-4 Skyhawks of Top Aces have taken on a new roll, ensuring the Air Forces of NATO remain in fine fighting trim. Recovered from its war time crash site in a swamp, and painstakingly rebuilt to air worthy condition, this is the sole survivor of a much maligned and limited production run of Corsairs built by the Brewster Company. 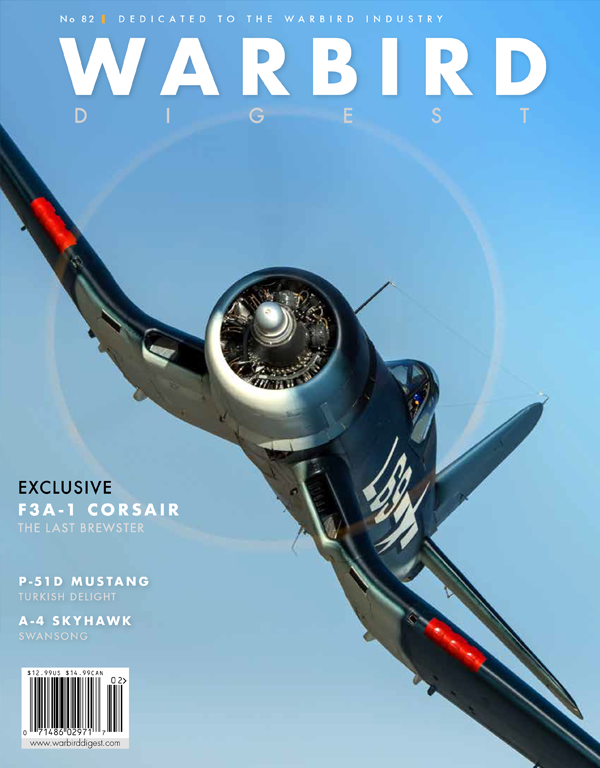 Legendary Atlanta Aviator, and Glacier Girl’s savior, Pat Epps’ fascinating life story brought to you by Warbird Digest. Entertaining an entirely new crop of enthusiasts, the P-51D Ferocious Frankie is a hit in Turkey!